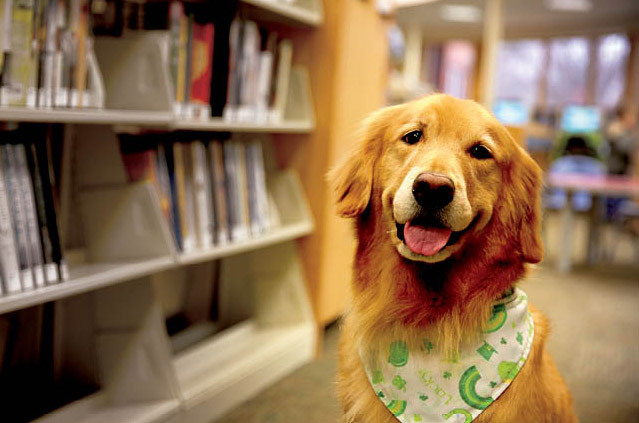 Friendly canines help young readers bone up on literacy skills. Calvin Vonbische and Charlotte are deeply engrossed in a book. Dogs do more than make us smile. They are supportive, loving pets; they provide a source of humor (and make efficient foot-warmers, too). They are our playful pals, our furry protectors and now, dogs help children gain confidence in reading. Learning a new skill is already intimidating. Practicing a new skill, out loud, in front of your peers, can be even more so. That’s where the dogs come in. 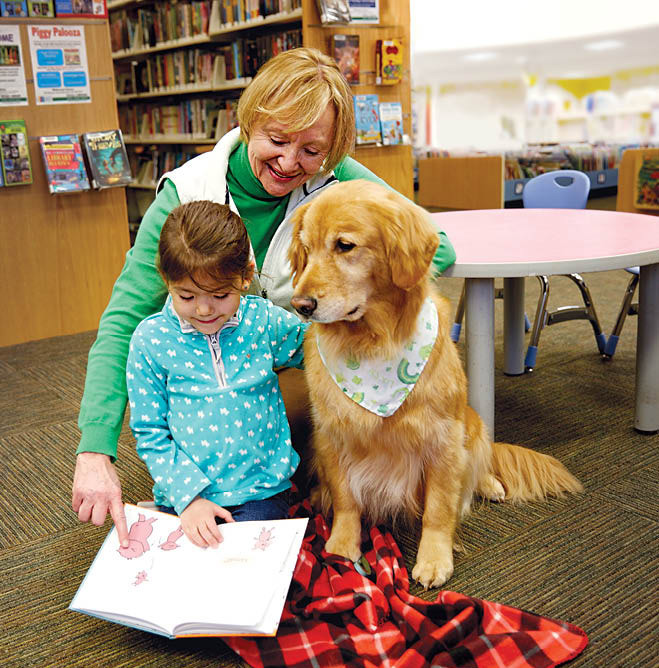 The Wildwood Library in Mahtomedi uses dogs to ease young readers’ tensions at the library’s reading program called Dog Gone Reading. Started by librarian Nancy Smith in 2008 at Hardwood Creek Library in Forest Lake, the program has since expanded across the Washington County libraries, eventually finding a home at the Wildwood branch every Thursday after school. The original idea was to provide a relaxed setting for children to practice reading aloud to a friendly canine and its trainer. This practice would be a worry-free opportunity for young readers to hone literacy skills and discover books in the library. The sessions would also provide the chance for kids to learn about dogs in a positive manner. Dog Gone Reading’s initial objectives still hold true. Every Thursday, readers in kindergarten through seventh grade can attend 15-minute sessions to read aloud to a sweet and calm dog. “The dog doesn’t snicker if you say something wrong, it just listens to you while you read,” Wildwood Library manager Megan Olson says of the dogs participating in the Washington County program. The dogs—all certified therapy dogs—range in size, species and age, but have one thing in common: They are all well-mannered. Charlotte feels right at home in the Wildwood Library. These basic good manners in dogs include the animal’s ability to sit and stay when the owner is out of the room, Melinda Elledge explains. Elledge has two certified therapy dogs, golden retrievers Phoebe and Charlotte, and has been participating in the Dog Gone Reading program for four years with Phoebe and one year with Charlotte. In order to become a certified therapy dog, dogs need to pass a test by Therapy Dogs International. If the dog passes, the trainer and animal are certified as a team. Both Phoebe and Charlotte love the reading visits. “They were sort of born to do this kind of stuff,” Elledge says. “They love people.” Her dogs know when they get to the library, and are eager to go inside to visit with everyone. “Phoebe likes to lie down and doesn’t mind if kids use her as a pillow. Charlotte likes to put her head in their lap and wants to be petted while being read to,” Elledge adds. Often before the reading begins, Elledge and the child will chat a little about their pets. If a child is a little apprehensive about dogs, Elledge has tricks to help the child be a bit more comfortable. “I always have the dog lying down or sitting,” she says. She will also give kids a little training on how to approach a dog they don’t know: Always make sure to ask the owner if it is OK to pet the dog (all the therapy dogs love being petted); then, hold your fist out gently to the dog’s nose to let it sniff you first. Audrey Doriott reads to Charlotte while Melinda Elledge looks on. At Wildwood Library alone, over 250 kids come each year, some of whom are weekly regulars. One regular, Castle Elementary fourth-grader Calvin VonBische, has been coming routinely since he was in kindergarten and enjoys the program immensely. He doesn’t have a favorite dog; he thinks they are all great. The thing he likes most about seeing the dogs? “You can pet them while you are reading.” The reading sessions are an important part of his week, and have increased his confidence in reading. “It helps me get better grades on my reading by practicing,” he says. “He is a very fluent reader,” Michelle VonBische says of her son. “A lot of that has to do with the practice he has gotten in the program.” VonBische says her son will rest against the back of the dog, curl up and read the book that way. “Everyone is very comfortable,” she says. In addition to developing Calvin’s reading skills, VonBische says the program has been great for making the library part of their regular routine. Thanks to the program, her son can find his way around the library with no problem, selecting age-appropriate books. Some readers pick out books beforehand, and others bring books from home. “As a library, we have plenty of options,” says Olson, who looks forward to more kids utilizing the program. To sign up for a reading session, call or stop by the front desk. 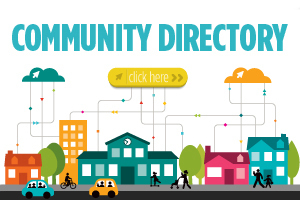 The sessions are offered free every Thursday starting at 4:15 p.m.